Hjem » Uncategorized » What is Kihon Happou 季翻初崩 ? 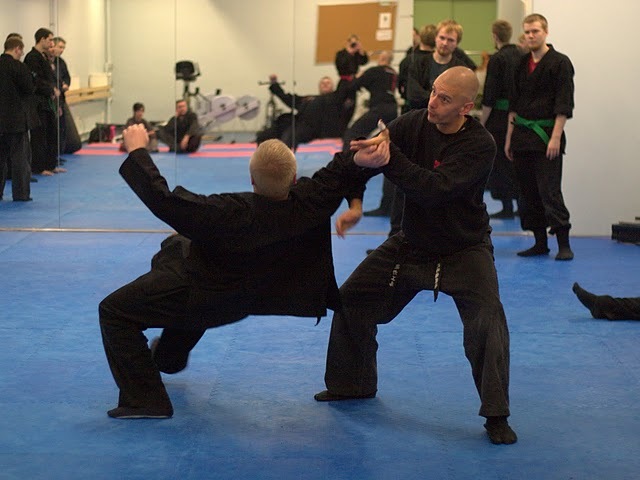 The theme for Bujinkan 2011 has been put out by our soke as Kihon Happou. Kihon Happou is quite mystical. It is wonderful and not like anything else I have experienced in my life. 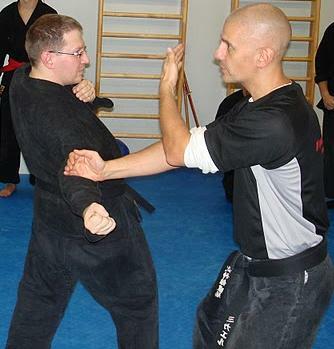 On the surface it is just the eight basic waza of the Bujinkan. But as you continuously study them throughout the years they unfold some wonderful secrets about surviving and life. 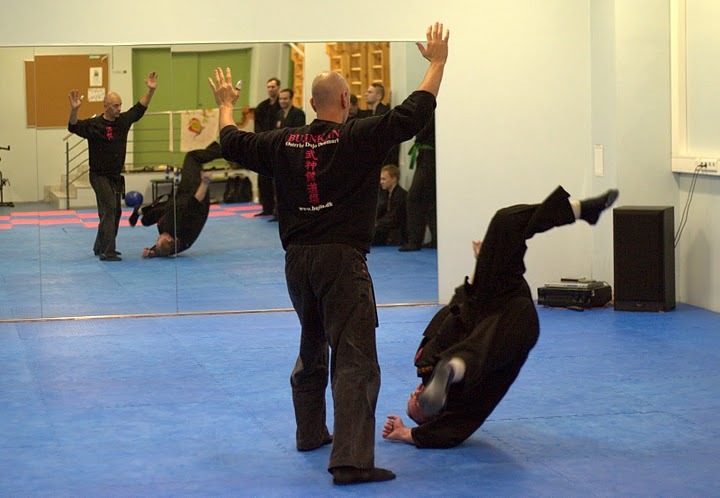 I have never gone tiered of practicing Kihon Happou. In fact the opposite. I love to do them as they always give me some new and more. I look so much forward to what soke will teach us with this years Kihon Happou. 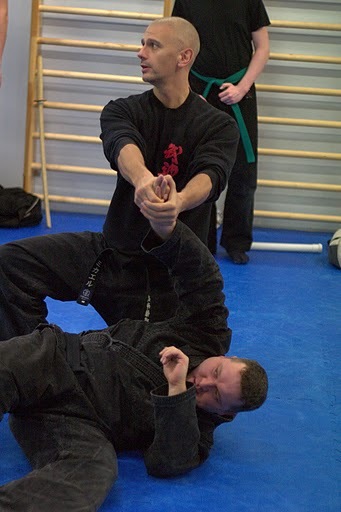 Kihon Happou is the foundation of Bujinkan. It comes from Gyokko ryu. Kihon usually translates as foundation and basis and happou can be translated as eight ways or gates. If you place the number “8” sideways it means infinitive. An important meaning of kihon happo is that the basic eight fundamentals are alive and gives birth to an infinitive number of techniques and possibilities. It is like the octaves in music. They consists of eight fundamental tones which gives an endless possibility of music by combining them. Actually they are one of nature’s wonders if you investigate them. Actually they double. For example, if one note has a frequency of 400 Hz, the note an octave above it is at 800 Hz, and the note an octave below is at 200 Hz. This reminds me of another translation I have heard soke use of Kihon Happou. Simply translated as “wonderful”. I think Kihon Happou is the same. It seems like you double the impact they have on your taijutsu every time you have practiced them for one year more. After 1 year you are at level 1. After 2 years at level 2. After 3 years at level 4 etc. That means that after 20 years of practice you have reached something like level 524288. As you can see the numbers starts to explode and becomes difficult to understand. I feel it is the same way with Kihon Happou. You can clearly see the difference between one who have practiced seriously for 1 year and one who has practiced for 5, 10, 15 and 20+ years even 30 and 40 years. There is huge difference and it seems like the gab becomes wider with the factor 2n the more years you have practiced. If you do not have the eyes you would probably not see this huge difference but it is very clear to me when being uke for example for the European or Japanese Shitenno and when being uke for Soke it is like another galaxy. In the beginning you can teach Kihon Happou because the beginner will only focus on a few details. After a few years it becomes more and more difficult to teach and explain Kihon Happou because of an infinitive number of details. It can only be absorbed and understood by feeling. There are too many details to break down. You have to chunk them all to one feeling. You have to see with your eyes and all the cells in your body. Kihon Happou could be symbolized by a tree. The roots are deeper and wider the older and bigger the tree is. The branches symbolize your weapons, arms and legs. Therefore the more power you need to deliver and the more bite your branches needs the deeper and wider your roots should be to give you a solid foundation to deliver and receive from. You cannot fire a canon from a canoe in other words. Kihon Happou could also be symbolized by a house. The height of the house is all your techniques and the foundation is your Kihon Happou. The more techniques you get the more base support you need for your house not to collapse. In other words you always have to return to kihon happou in your training to make sure you have base support for your fancy moves ;-). I would not like to see you end up as the clown in the center only fooling yourself. Kihon Happou should not be considered as eight firm waza which should be done in a strict way. There is not ONE correct way of doing them. Every person finds his own Kihon Happou after many years of following and copying his instructor. On the other hand there are many mistakes you can fall into when doing Kihon happou. If there was a strict form of Kihon happou it would be without life. And life is a key factor of Kihon happou. In order for us to reach master level I believe it is important at a certain time to let go of copying our sensei. This is very important. If you never let go you will have a dialect and be predictable even if you have extreme good and precise taijutsu. On the other hand if you let go too soon you may end up not learning even the basics of the language. You will have too many holes in your techniques and have to invent your own way of copying. Your own language. That is a dangerous path to follow I believe. In an interview from Tetsuzan soke compares dialects to faults and says in a part about eliminating faults: “Bugei is the same way. If one reaches to a higher rank, he need only eliminate his faults. It may sound easy, but eliminating faults is very difficult to accomplish, because we tend to think we are faultless. Faults can be translated into something different in Budo. They can be suki (unguarded points), or carelessness, presumption, arrogance, etc. they all become our fault. No fault, zero condition is the best. I am zero. I joke that the Soke has no Dan. Zero, no fault that is the target of Bufu Ikkan (living through the martial winds)”. It is important to have heart (the correct heart) when doing kihon happou. If so you are alive and can naturally adapt to the ten thousand changes. Kihon is always changing as life itself. Kihon Happou is life. Kossh means to destroy your opponent with just one finger. This is the essence of Budo. Too win with least effort. Kosshi can also be translated as “essence”. Kosshi kihon sanpo are basic forms that teaches us abut ichimonji, hicho and jumonji. It is important to notice that when studying kamae you unify your body, mind and spirit. As such the kamae is not only a physical body position, but a reflection of your heart. Therefore it is of most importance that you continuously work hard at developing a just, harmonious and sincere heart. You put your spirit in to it to give it life. That makes the whole difference. It is like a human being who just have died. It is quite different from a living human being. The physical body is the same. It is still warm and all the materials are the same. All atoms, hormones, enzymes, cells etc are still the same, but something is missing. Something we cannot measure with instruments. Yet it is very visible. Something that makes the heart beat and the electricity run in our nerves etc. The difference is the life force, the spirit. The spirit has left the building. What brings life to a human being is his or her spirit. And what brings life to your taijutsu and your kamae is your spirit. In other words, your life force which should reflect your heart and give you purpose and attitude. It is said that the ninja must have a heart that is as beautiful and harmonous as a flower and as straight, strong and flexible as bamboo. This is very important. Kihon Happou begins with kosshi kihon sanpo and torite kihon gata goho. Acording to our soke it is important to build bridge between these and Happo Biken, Bugei Juhappan and Ninja Juhakkei. First then you you will understand Kihon Happou. This gives life to ten thousand possibilities. This ten thousand possibilities becomes infinitive. That means without beginning and end. First then the true essence of Kihon Happou becomes alive. 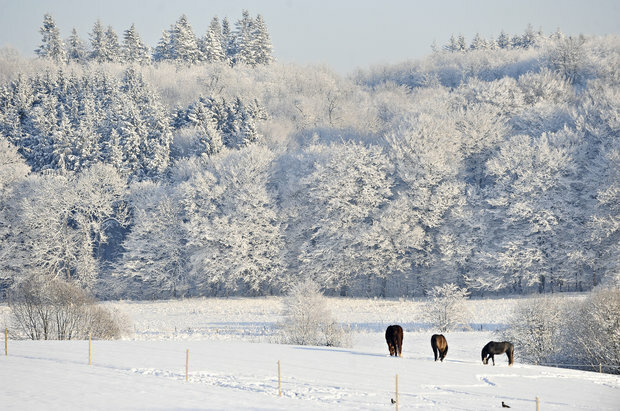 I hope you will all be very vibrant and alive and that that we will all continue to grow deeper roots in 2011. So we can take in more nutrition and harvest more beautiful fruits in our life.